The Nashville police department took just four days to close the case. At a July 8, 2009, press conference, Metro Police announced their murder-suicide findings, stating McNair had been shot to death by his mistress, Sahel (Jenni) Kazemi, who then took her own life and was found at McNair’s feet, lying atop the 9-millimeter Glock pistol that had killed them both. But almost from the moment Metro Police announced those findings, questions have been raised by a vocal minority suggesting McNair was really killed by someone other than Kazemi and that she was killed to cover the tracks of the true murderer. There have been books written, TV true-crime investigations and documentaries – and now a new Sports Illustrated narrative podcast tackles the case with the hard-hitting journalistic goals of probing all aspects of the crime while trying to definitively answer the murder-suicide question. 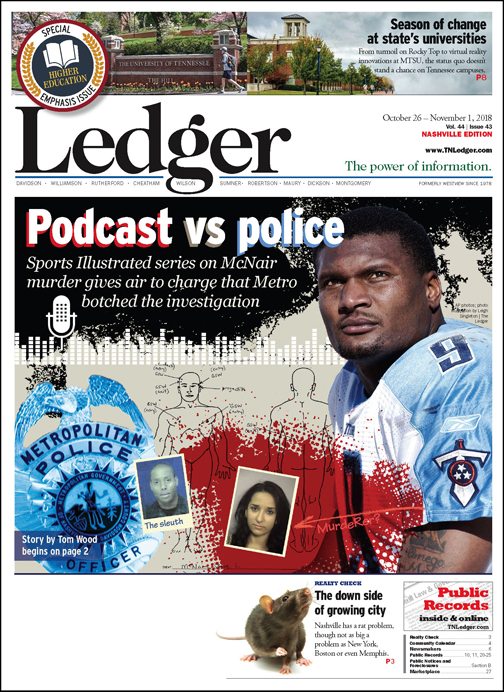 The podcast, which debuted Oct. 17, is titled “Fall of a Titan: The Steve McNair Story.” New episodes are available on Wednesdays via Apple Podcasts, Spotify and Stitcher. Coincidence or not, the number nine crops up often when looking at the SI exposé. McNair wore No. 9 for the Titans, the podcast is being told over nine episodes – chapters, really – and it has been nine-plus years since the sensational crime occurred. “This really is like a true-crime mystery, right? The police are certain that it’s 100 (percent) closed, but there’s a lot people that feel like this thing’s still open,” says SI’s Tim Rohan, an NFL writer for the magazine who spent 15 months researching, writing and hosting the project. For the most part, at least in the first episode, “The Private Eye,” Rohan sticks to his journalistic instincts in re-examining the case through the eyes of Vincent Hill, a former Nashville policeman and private eye who now hosts the Beyond the Badge podcast and is a law enforcement analyst for Fox News and other television outlets. “I think, journalistically, we’re walking right down the middle,” explains Rohan, who was interviewed for this article on the day after the first episode was up and running. “There are people that want to have the case reopened, and we’re talking to them. 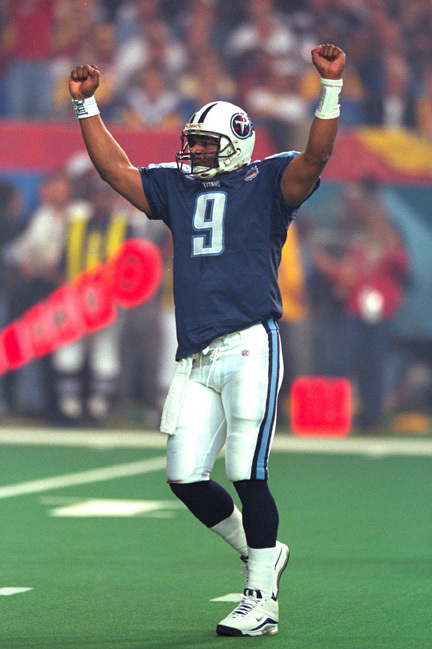 Titans quarterback Steve McNair celebrates a touchdown against the St Louis Rams during Super Bowl XXXIV in 2000, nine years prior to his death. But there are aspects that some would say are nothing more than innuendo and speculation – particularly at the end of the first episode when Hill tells Rohan a gruesome crime scene detail involving dismemberment. The autopsy report makes no mention of what Hill described, and Rohan defends using it in the podcast. “I hadn’t seen that reported anywhere,” Rohan adds. “I think we make it clear in the podcast that that’s a rumor. And I’m not saying that that’s fact. Metro law enforcement officials deny a rush to judgment in the four-day investigation, and note that Hill’s 2010 push for the grand jury to reopen the case failed. “Charles Robinson, the lead investigator, and his supervisor, Pat Postiglione, sat down and talked with (Rohan) about the case. The detectives who were in charge, and this police department, stand by the results of that investigation,” says Don Aaron, the Metro Police public affairs manager. Retired Davidson County deputy district attorney Tom Thurman was equally fervent in denying suggestions of a botched police investigation. “We reviewed the crime scene extensively, and I went over it with Pat and other investigators. It is clear to us that it was a murder-suicide. There is no question that is what happened,” Thurman states. “So many things pointed to that. We found the person who sold her the gun. The way the body was positioned, it would have been impossible to stage (a crime scene). Postiglione also strongly defended the official findings. College career: Alcorn State 1991-94. Highlights: Had 14,496 career passing yards for 119 TDs and 16,823 total yards, both FCS yardage records. In his senior season, he won the Walter Payton Award for I-AA player of the year and was third in Heisman Trophy voting before being selected No. 3 overall in the 1995 NFL Draft by the Houston Oilers. NFL career: Oilers/Titans 1995-2005; Ravens 2006-07. Highlights: Had 31,304 career passing yards for 174 TDs; 3,590 rushing yards for 37 TDs. Led Titans to four playoff appearances, reaching the 2000 Super Bowl XXXIV before falling to the Rams 23-16. He was a three-time Pro Bowl selection and the 2003 co-Most Valuable Player along with Peyton Manning of the Colts. Died: July 4, 2009 in Nashville. Buried in Prentiss, Mississippi. “The evidence clearly points to a murder-suicide. We follow the evidence, that’s it,” Postiglione says. “If the evidence pointed to a double homicide we would have been all over it. “There are some that argue it’s a double homicide, but other than speculation and guess work they have nothing to support their theory. Just because they continue to repeat it, doesn’t make it so. If Hill’s queries come off as some sort of conspiracy theory like questions surrounding the John F. Kennedy assassination, Rohan wants to make clear that neither he nor Sports Illustrated are being used to further an agenda. “I know what you’re getting at. My answer to that would be, I think you’ll see in the coming weeks that we do a good job of … if Vincent makes a good point, we may raise it, but we’re also careful to fact-check Vincent and hold him accountable, and this isn’t just following Vincent Hill blindly,” Rohan says. “This isn’t the Vincent Hill show. We’re making sure that we’re holding him accountable when we bring up his theories or whatever. But at the same time, he does make some good points about the case,” Rohan adds. Rohan continues, saying Hill’s obsession with the case is both an asset and a liability, and talks in the podcast about Hill’s issues with Nashville Police, including a suspension in 2005 and a pending suspension in ’06 before he left the department. “Vincent himself would admit that he’s been consumed with this case for the last nine years,” Rohan points out. “And why I think he’s such an interesting character in all this. “As a journalist, whenever you talk to anyone, you have to make sure that what they’re telling you is, you know, up to snuff and … Vincent certainly has a lot of knowledge of the case. Rohan assures listeners that all voices will be heard in coming episodes. He’s talked to detectives, former Titans, friends of Kazemi and McNair, forensic pathologist Dr. Feng Li, who conducted the autopsy – most everyone except members of the McNair family, who declined to participate, Rohan adds. 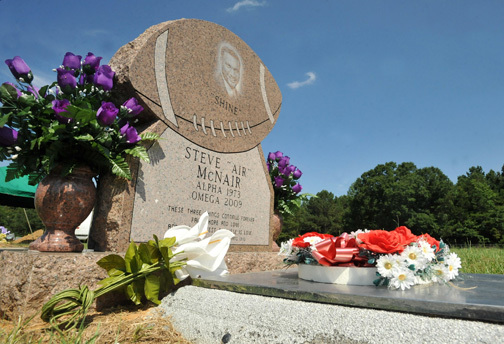 Former Tennessee Titans quarterback Steve McNair is buried at Griffith Cemetery near his hometown of Mount Olive, Mississippi. The podcast is still a work in progress, with at least three episodes complete and the majority of other episodes mostly finished. The second episode, titled “The Quarterback and the Professor,” was released on Oct. 24 and focused on McNair’s college days and his relationship with Alcorn State professor Dr. Alvin Simpson. The third episode is “The Waitress.” It premieres on Halloween and unmasks Kazemi, who was working at Dave & Buster’s at Opry Mills when she met McNair. “We’re going to kind of walk through what happened and what was going on with her in the weeks leading up to her death. And why, I guess, some of her family and friends still don’t believe she killed Steve McNair,” Rohan explains. “Beyond that, we obviously have scripts ready to go and all that, but we’re still in the process of finalizing some stuff – some of it’s fluid and some of it’s not, so I’d prefer to not go beyond that. Rohan acknowledges he understands why members of the McNair family declined to talk to him. “I’m sure there were several people I would have loved to talk to, but I think the most important people were probably Lucille McNair, Steve’s mother, and Mechelle McNair, Steve’s widow. And then Steve’s brothers, they all declined to comment to me,” Rohan says. And not just for the McNair family. Steve was a beloved athlete and hero for many in Nashville, even after the darker side of his personality came to light. Rohan says he tried to balance the emotional aspects of the case with the thoroughness of a reporter doing his job. “I was aware throughout the whole process that it’s a sensitive case, an emotional case that strikes a chord with a lot of people. But at the same time, the people I did talk to, these are people who were close to Steve – and close to Jenni, too – and a lot of them had these questions,” Rohan says. “I like to look at it this way: I’m just reporting the questions that they have. From what people told me, Steve’s mother had a lot of these same questions at one point in time, too. So, I just kind of follow the reporting, and I don’t look at it as if I’m particularly opening the case.